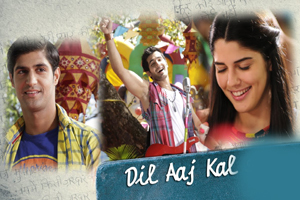 Beautiful love song in the voice of K. K featuring Tanuj Virwani, Aditya Seal, Izabelle Leite. The video of this song is available on YouTube at the official channel Eros Now. This video is of 3 minutes 45 seconds duration. The lyrical video of this song is also available on YouTube at the official channel Eros Now. This video is of 5 minutes 21 seconds duration. Lyrics of "Dil Aaj Kal"
Lyrics in Hindi (Unicode) of "दिल आज कल"